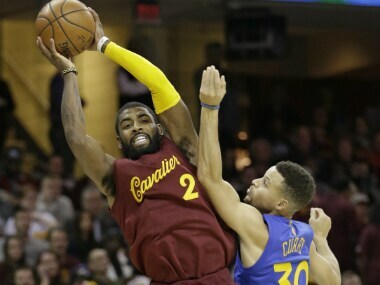 Los Angeles: Kyrie Irving's turnaround jump shot over Klay Thompson with 3.4 seconds left lifted the NBA champion Cleveland Cavaliers to a 109-108 Christmas Day triumph over the Golden State Warriors on Sunday. The rematch of last June's NBA Finals highlighted the league's holiday slate, and didn't disappoint. The rematch of last June's NBA Finals headlined the league's holiday slate, and didn't disappoint. The Cavaliers -- who rallied from 3-1 down in the championship series last season to deny the Warriors a second straight title -- trailed most of the game and were down by as many as 14 earlier in the fourth quarter. LeBron James's rim-rattling dunk with 1:43 to play put Cleveland up 105-103 -- their first lead since early in the first quarter -- and Irving capped the comeback with a clutch shot that recalled his championship-winning three-pointer in the final minute of game seven last June. 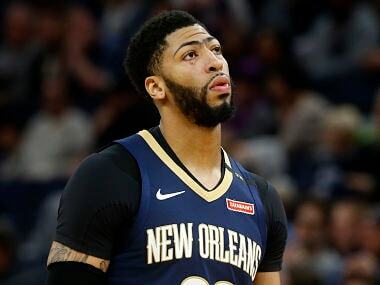 "He's just a killer on the court," Cleveland coach Tyronn Lue said. A beaming Irving said it was the perfect holiday treat. "It's nothing like the playoffs," Irving said, "but the intensity was up there. This is what you want to be a part of as a professional." Irving finished with 25 points, while James had 31 points and 13 rebounds. Kevin Love had 20 points and six rebounds for the Cavs. 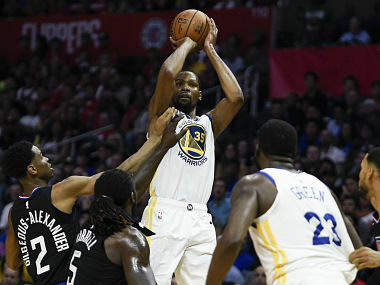 Kevin Durant, who arrived at Golden State as a free agent in the off-season, was superb in his first appearance in the Warriors-Cavs rivalry. Durant scored 36 points and pulled down 15 rebounds. 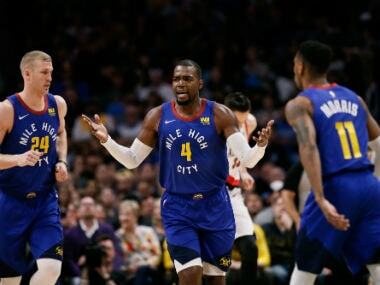 But after Irving's key basket he was unable to get off a potentially game-winning shot, getting tangled with Richard Jefferson and hitting the floor. No foul was called and time ran out. "I was trying to make a move. I didn't fall on my own," an irked Durant said. Thompson scored 24 points and Draymond Green added 16 despite foul trouble. 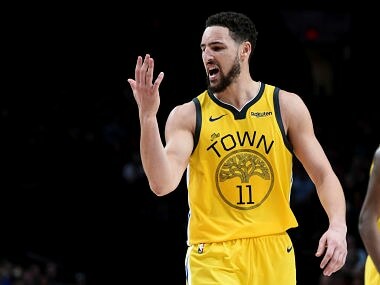 NBA Most Valuable Player Stephen Curry scored 15 points but connected on just four of 11 from the floor. It was a modest showing for the prolific Curry, but his three-pointer with 1:14 to play put Golden State up 108-105. Curry gestured to the Cleveland crowd in celebration, but it proved to be too soon. "We're mad, man," Thompson said. "The way we lost that game, we gave them a gift." The contest was the highlight of the NBA's five-game Christmas Day line-up. The Boston Celtics opened the action with a 119-114 victory over the New York Knicks at Madison Square Garden, where Marcus Smart's tie-breaking three-pointer with 47.8 seconds to play helped the visitors thwart the Knicks' comeback bid. In San Antonio, LaMarcus Aldridge hit his first 11 shots from the floor en route to a season-high 33 points in the Spurs' 119-100 victory over the Chicago Bulls. The Spurs built a 20-point first-quarter lead but had slipped behind midway through the third quarter before again roaring past the Bulls in the final 16 minutes. Russell Westbrook scored 31 points and handed out 15 assists to lead the Thunder to a 112-100 victory over the Minnesota Timberwolves in Oklahoma City. Westbrook also pulled down seven rebounds for the Thunder, who had 22 points from center Steven Adams of New Zealand and 20 from Turkey's Enes Kanter. In the Timberwolves' first appearance in a Christmas Day game, the young Minnesota team shot 55 percent in taking a 27-23 first-quarter lead. But they couldn't keep up the pace and the Thunder, led by a gleefully relentless Westbrook, pulled away for a third straight victory. "I just go out and have fun," Westbrook said. "I don't know if it's the most fun I've ever had but it's definitely at the top because of the group of guys we have. Everybody is so unselfish. Everybody is willing to do great things." The Lakers capped the day with a 111-102 victory over the injury-depleted Clippers in an All-Los Angeles duel. The Lakers beat the Clippers for the first time since October of 2013, snapping an 11-game skid against their cross-town rivals.